What do you do when you have an abundance of blueberries that are about to over-ripen? The answer is easy if it's a lazy Sunday morning, you are craving pancakes, and you are all out of maple syrup. I've been playing around with fruit reductions over the past year. I made a cherry sauce that I used for some cookies with which I was experimenting (that never saw the light of day - the red mixed with the flour and butter gave the dough an unsightly gray tinge, even though they tasted ok). I had more success with the raspberry syrup I made for my Raspberry Chipotle Sweet Potatoes, which I plan to make often this coming fall. Blueberry syrup seemed like the next logical step. And I'd been craving buttermilk pancakes for the longest time. And searching for a good recipe, too. I found one on the website joyofbaking.com. There sure are a lot of cooking sites out there in the virtual world. This one seems to have a lovely selection of recipes for all kinds of delicious-looking baked treats. I will have to visit it more often. 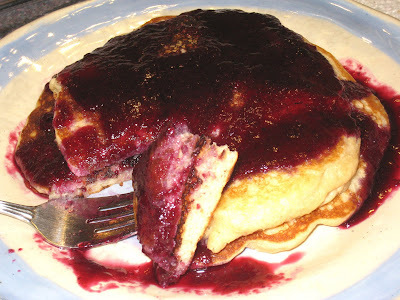 I also found a recipe for making blueberry syrup online. It involved cooking the blueberries with lemon juice and then straining the mixture through cheesecloth before cooking it again with sugar. This recipe also involved boiling jars and sterilizing lids, but since I was only going to use a pint of blueberries I decided I didn't need to go to all that extra trouble. 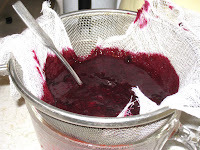 Straining the blueberry mixture through the cheesecloth was trouble enough. It took a long time because the mixture was so thick. I also didn't use a big enough piece of cheesecloth, but that's another story. The end result was quite delicious, and complemented the pancakes perfectly. But I think it would work just as well if I cooked the blueberries, lemon juice and sugar together and then strained them. Less work, too. I was especially happy with how the pancakes turned out. Light and fluffy, just a hint of sweetness. If they look a little dark on top up there in the picture, that's because I had the cast iron skillet a little too hot. They were just this side of burned, but definitely still edible. Next time, however, I will know how hot to let the pan get. Combine the dry ingredients in a large bowl and whisk together to blend thoroughly. Put the egg, buttermilk and ghee in a separate bowl and whisk together. Add the egg mixture to the flour mixture and stir until just combined. Do not overmix. Place a cast iron skillet or griddle over medium high flame and heat until water sizzles and dries instantly when flicked into the pan. Brush oil over the pan's surface. Pour about 1/4 cup of batter into the pan. You can cook more than one pancake at a time, but be sure to leave plenty of room around them so you can turn them without splattering any surrounding pancakes. Let cook without touching for 2-3 minutes, until bubbles form on the top of the batter and the edges are cooked. Flip the pancakes over and cook another minute or so on the second side. Stack finished pancakes in an oven-proof dish and keep warm in a 250 deg. F. oven until ready to serve.